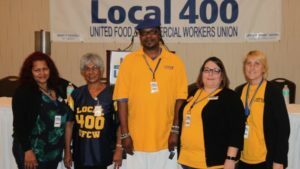 Members of UFCW Local 400 who work at 22 Kroger stores in the Richmond and Hampton Roads areas in Virginia ratified a new contract on Sept. 11 that raises wages and protects benefits. The contract, which was ratified by an overwhelming margin, covers approximately 3,700 members of UFCW Local 400. The new contract, which increases pay, and preserves health care and retirement benefits, takes effect immediately and extends through August 7, 2021. Other contractual improvements include accelerated wage scales with guaranteed pay increases twice a year, annual bonuses for the most experienced associates, and premium pay for select positions in the stores. Contract negotiations between UFCW Local 400 and Kroger began in early July. A team of six Kroger store employees led negotiations on behalf of the union.